In this report, we organize and share annual revenue of 25 leading video surveillance companies. Revenue numbers are often useful for businesspeople and investors to better understand size and relative power of players in a market. That noted, this list should NOT be used for buying decisions or evaluating technology as a weak relationship exists between revenue and product quality. To maximize accuracy, we only listed revenue for companies whose revenue has been been audited and/or validated by government regulations. Often, analysts state company revenue based on rumors or what the manufacturer tells them their revenue is without any external validation. This approach has a high degree of error. Overall Market Size: General consensus is that the global video surveillance market size is ~$10 Billion USD. This is typically sized based on manufacturer sales and includes neither markup by integrators/dealers nor installation costs. Including all costs, total gllobal surveillance market size is ~$20 - $25 Billion range. Overall Market Growth: General consensus is that overall video surveillance market growth is 5% to 15% per year. The range is broad because (1) the industry is highly dependent on the global economy growth rate, (2) that growth rate has fluctuated significantly since the 2008 recession and (3) projections for China which skew growth rates higher. Company Size: Video surveillance sales for even the biggest companies are under $1 Billion USD annually, ~ 95% of companies are under $100 USD Million and ~50% are under $25 Million USD. The market is highly fragmented and most companies selling surveillance are not selling a lot. WARNING: Do not use the tables below to rank or rate manufacturers. Revenue gives a rough sense of how big companies are but it is a terrible way to judge if one company is 'better' than another. If you want to know who's 'better', read our Buyer's Guide or the VMS and IP camera favorite reports. The table below is sorted by revenue in descending order. All numbers are approximations and for the most recent 12 month period revenue was disclosed. In this grouping, Hikvision is the company that might be the biggest surprise and in greatest need of clarification. While their revenue is very high, recent Hikvision financial reports reveal that 82% of their revenue is from inside of China. Hikvision's international sales are about $120 Million - roughly the size of Verint. The second table below is for companies that offer video surveillance but do not break down their video surveillance specific revenues. While their revenue cannot be compared to the table above, it's useful to get a rough sense of their overall size in the market. GE Security, now a part of UTC, is big but has been declining significantly for many years. Large player but increasingly a non factor in the surveillance industry. Anixter is a distributor and obviously not a manufacturer but has been growing solidly in surveillance and security for the past few years and is becoming an increasingly powerful player. CSST has a huge amount of video surveillance revenue but the overwhelming majority is for installations within China. It would be greatly misleading to compare this to international product revenue of other manufacturers. Ubiquiti is overwhelmingly a wireless equipment provider for general networking / WISP deployments. However, they already have a non trivial surveillance market share as their wireless networking equipment is likely the most common choice (by unit, not revenue) for surveillance integrators today. A number of the biggest global surveillance providers are not cited here, including Bosch, Honeywell, Panasonic, Pelco and Sony. We estimate that all of these companies have surveillance specific revenue in the $250 Million to $750 Million range, meaning that they are much bigger than all the companies on the list save for Axis and HikVision. Because this list is derived from publicly disclosed financial records or audited results submitted to 3rd parties, it is skewed to larger, more mature companies. The bulk of the surveillance industry including niche players not mentioned in this list typically generate between $5 to $15 Million in annual revenue. We estimate about 2/3rds of all surveillance companies not listed in the tables above generate between $5 and $15 Million in annual revenues. From scanning these tables, it is clear that most of the largest companies sell a broad range of products including cameras and recorders. It is not a coincident that most specialists companies cannot break $100 Million in revenue. All 3 downward trending companies, that is companies whose revenue is declining by more than 10% per year are traditional analog/CCTV companies. Of the 3, Dedicated Micros and Vicon have been on a continuous downward path for years while March Networks recently experienced a sharp negative drop. Two IP companies deserve special mention of relative poor performance - ACTi and IndigoVision. While their revenue has been essentially flat over the last year, as specialists in IP only, this far lags the segment norm of 20-30% growth. This list continues quite a number of strong growth companies which we define as companies generating 25% or higher revenue. However, this should not meant draw a conclusion that the market overall is growing strongly. On the contrary, there are a number of fast growing IP centric companies - Arecont, Avigilon, Axis, Exacq, Milestone, Vivotek etc. who are clearly taking market share from traditional CCTV incumbents. Now, in 2011, the combination of their increasingly large size (beyond Axis's ~$500 Million, the other 5 companies now combine for ~$250 Million revenue) and their continued sharp growth rate is resulting in a transfer of power from CCTV incumbents to IP specialists. While industry luminaries love to talk about the power of acquisitions and the continuous impending consolidation within the industry, these numbers show the reality is the opposite. The market is actually fragmenting even further as IP specialists companies come of age as powerful forces in their own right. The companies that have been acquired in the past few years tend to be companies that struggled to make it on their own - Advasense, Intellivid, ioimage, Keeno, Orsus, Rontal, Vidient, etc. GE Security is huge and did change hands but GE Security lacks innovation in surveillance so it's basically shuffling deck chairs on the Titanic. 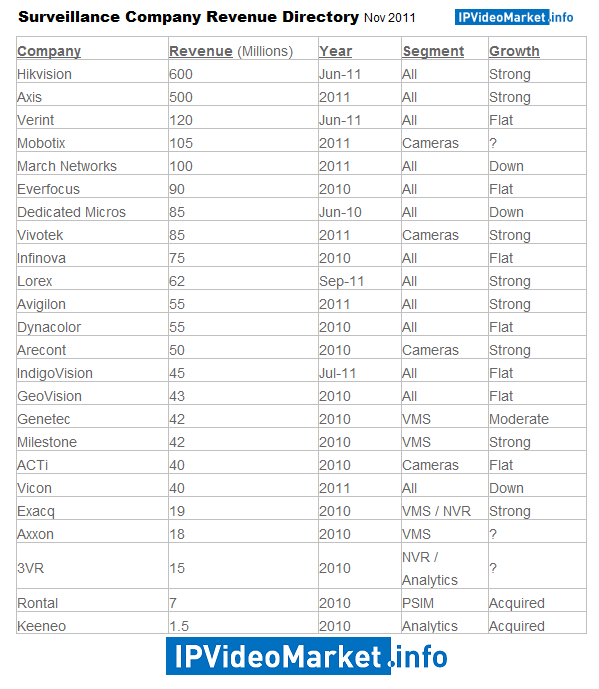 It will be interesting to see if the fast growing younger companies eventually get acquired but many of them have already IPO'ed (Avigilon, Axis, Hikvision Mobotix, Vivotek, etc.) so the motivation to sell to Honeywell, Bosch, etc. is much lower. We believe that most acquisitions will continue to be of second tier companies that do not have better options for an exit for their investors.